It’s a brave statement to open this article with but I believe Audi have tried to create the king of the hot hatches in a very competitive segment, where many manufacturers line up bold contenders. Perhaps in contrast to the established image of the company, given most modern drivers hear Audi and think: Vorsprung Durch Technik; reliable; mundane; quality; high end; premium; family car; and of course, the old Northern Ireland favourite – diesel. Now, this is all pretty acceptable given the direction of the company in recent years. I would expect to hear those answers from varying walks of life and from varying ages, all with differing needs from motoring. Though when it comes to those with a bit of a passion for cars, Audi conjures images like: Quattro; Group B rallying, 24 hour racing, touring cars; and the cult RS models. In fact, these are the things that spring into my mind. When Audi UK confirmed that I was getting their latest RS3 Sportback for a week, I must admit, I wasn’t totally sure what to expect. Any previous RS (short for RennSport – roughly RacingSport in English) model I had driven was much, much larger. 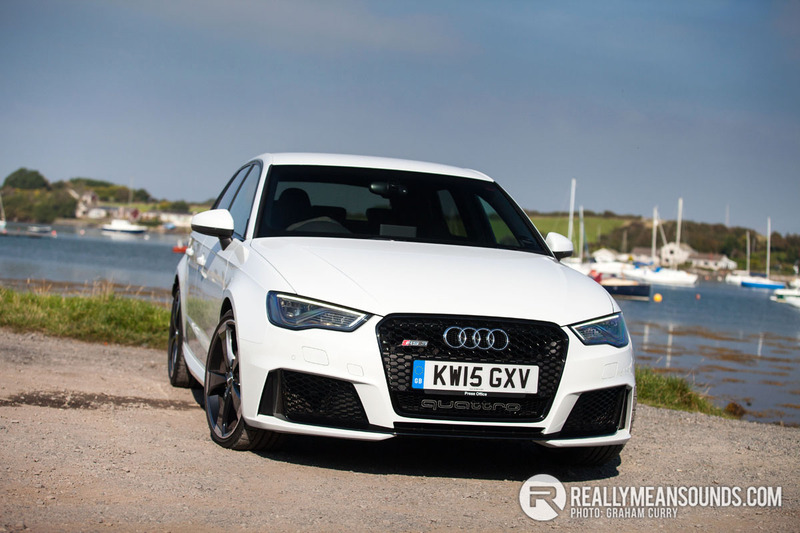 The RS4 and RS6 are huge in comparison to the RS3 and naturally, much heavier. However, they also have big capacity V6 or V8 engines, with mental power to match. This lack of knowing what I’d get my hands on only served to excite me more. As the days passed and my delivery date grew closer, I heard more and more great things about the RS3. Colleagues in the know stated it was, without a doubt, the best car they have driven all year. The hype was building. I arrived home last Monday afternoon and there it was. I was greeted by a rather stunning rear end, with two very large oval exhaust pipes poking from the gloss black diffuser. The crisp, metallic white paint looked very distinguished and, as I raised my eyes, a very meaningful roof spoiler stood out. RS Audis usually have very purposeful, expanded arches, which give the game away. The RS3 is quite sober by comparison, with no real extra girth. This is something that I think helps the car blend in, rather than stand out like a streaker on sports day. Walking round the car, though, I couldn’t help but notice the huge floating brake discs and red calipers, which reminded me that this car means business. The front end of the RS3 is rather aggressive looking, with a face full of gloss black grills. The gives the car a certain presence, especially if you saw it coming in the rear view mirror. When I opened the door for the first time, I only wanted to do one thing: sit in the seats. Beautiful cross stitched, perforated leather reclining buckets, with one piece backs and generous bolsters to hold you in, no matter what the speed. The next thing that caught my eye was the machined alloy on the climate control unit knobs and all around the heater vents. It’s those little Audi touches that show that they are all about the attention to detail. Just like the carbon fibre dash and door inserts. Whilst these came on the car I received, carbon fibre may not be available to order in the UK market yet. Once they are available, I feel they are a must have option, just stunning. Once I adjusted the lavish seats to my liking, I found the electric window controls and the large infotainment control knob a little too close, which was a bit of a disappointment. I was having to twist myself to grab these controls, which is a minor gripe, but one which did keep niggling at me. I will also feel that if I was spending over £50k on a car (RS3 models start from just shy of £40k, plus options), I would want motorised, adjustable chairs up front. Although I do understand that an RS model is fitted with the manual seats to save weight. The infotainment system was very easy to understand from the LCD screen which pops out of the dash. The acoustics were excellent and the Bang & Olufsen audio (part of a four figure options kit) was incredible. The car was high quality, but that was to be expected with such a huge price tag. Especially compared to the likes of the VW Golf R or the Mercedes-Benz A45 AMG, which would be a fair comparison in this class. After getting to grips with the controls and navigating through the onboard nav, it was time to “fire up the quattro”. At this point, I very nearly managed to fall out of the sumptuous seat. Quite simply, this has to be one of the most glorious sounding engines around. Audi’s roots and success in rallying back in the mid-eighties was based around a five cylinder engine. This RS3 gets a similar style 2.5 litre 5 cylinder turbo with the sound track to match the heritage. With 367bhp and 343lb/ft going to the ground via the seven speed S-Tronic semi-automatic gearbox, the RS3 is most certainly no slouch. The car offers three modes. A manual shift using a stick, paddles on steering wheel, as well as auto with sport function. There is even launch control and the Audi system is most certainly one of the most aggressive I have come across. Once the car launches and the traction system sorts out optimum grip, it propels you like a homing missile. Incredible technology that really works. Driving in a spirited manner using the S auto mode, it’s the best gearbox I have driven for holding gears and predicting what gear you need to be in. I had several blasts along winding side roads and found it faultless. The RS3’s ride quality was firm, but very grounded. Handling was predictable with reasonable feeling via the steering wheel. The car is that quick point to point you would often find yourself braking for most corners as it gathers speed like a fighter jet and then corners like a spitfire. This sportiness is all well and good, but the fuel economy will drop to the mid-teens as a result. On my daily commute, I achieved figures in the late twenties in normal D auto mode, with the stop/start technology activated. So is it the king of hot hatches? Well, the RS3 is far removed from my established idea of a traditional hot hatch. You know, that lightweight shopping trolley that needs driven at ten tenths, like the 205GTis and Mk2 Golfs we once fell in love with. But that era is long gone and this nu-breed hot hatch needs to be so much more. So bearing this in mind I will deliver my verdict based on what a hot hatch has now become. Yes, I do believe the Audi RS3 has claimed the hot hatch throne, due to its sheer pace alone! It’s quicker than lightning. It is also the roomiest hot hatch on the market and makes a perfectly practical daily driver that could easily absorb the odd track day. It’s £10k more than some of the rivals but given that solid German engineering and high calibre cabin, I could easily talk myself into that extra spend! Great car but not what i think when i hear "Hot hatch" (5 door hatch) !! Would suit my needs perfectly,would happily trade my s4 avant if I had the £££ to do so.prob my next cat TBH. Great article and photos Graham. Totally agree with what you have said. Especially regarding the type of car it is. Either-way it offers serious real world pace, in a premium package, the engine massively adds to the appeal. When was it ever that sunny at Whiterock this year! Doesn't really look special enough to me, just looks like a diesel A3. They could have put better alloys on as well I think. If you're spending that sort of money you want the the sort of car that makes you turn round and look at it when you're walking away from it, and I don't think you would with this car. Needs more pomp and ceremony in the styling department. My own opinion of course. Flame suit on. Needs rs4 type flared arches and wheels changed for sure. I quite like it although the arch's could be a little be wider seeing as its an RS model. Waiting on @Brennan seeing this and messing his cack's and telling everyone that BMW and Mercedes can't get close to it because Audi. id agree on this, everything else bar the looks is immense. are they really hot hatches though with the associated price tags? if so what are S3's and GTI's now? | Great article and photos Graham. Totally agree with what you have said. Especially regarding the type of car it is. Either-way it offers serious real world pace, in a premium package, the engine massively adds to the appeal. Thanks, really enjoyed having this one. | When was it ever that sunny at Whiterock this year! A few weeks ago, thankfully | Doesn't really look special enough to me, just looks like a diesel A3. They could have put better alloys on as well I think. If you're spending that sort of money you want the the sort of car that makes you turn round and look at it when you're walking away from it, and I don't think you would with this car. Needs more pomp and ceremony in the styling department. My own opinion of course. Flame suit on. We like a goo healthy debate and all valid points that many will agree with. | Needs rs4 type flared arches and wheels changed for sure. Yeah, I think I touched on the lack of big arches that we all expect from the RS models | id agree on this, everything else bar the looks is immense. are they really hot hatches though with the associated price tags? if so what are S3's and GTI's now? GTi's and S3's are now dwarfed with the new breed of hatch back cars sadly !